To make working with files on your laptop easier, you may want to control which applications are used to open files of different types by default. For example, you might always want word processed documents to be opened by Microsoft Word or WordPad. Click System → Default Apps. 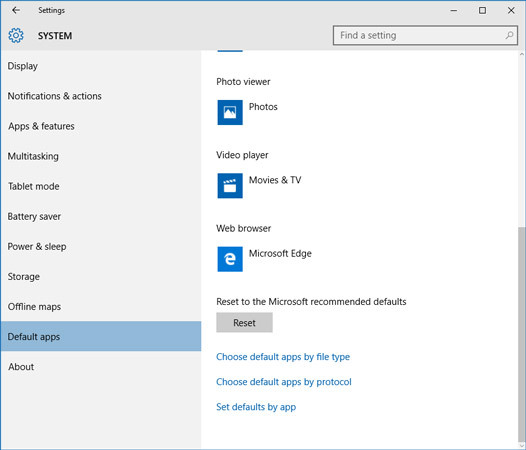 In the resulting window, scroll down and click the Set Defaults by App link in the right panel to see specifics about the default programs. 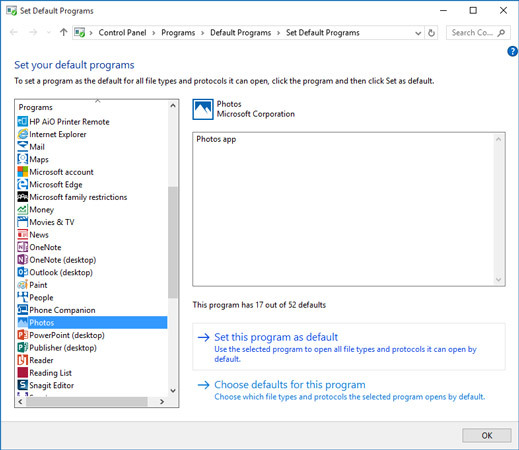 In the resulting Set Default Programs window, click a program in the list on the left and then click the Set This Program as Default option. You can also click Choose Defaults for this Program and select specific file types (such as the JPEG graphics file format or DOCX Word 2013 file format) to open in this program; click Save after you’ve made these selections. In the Set Default Programs window, click OK to save your settings and then click the Close button.